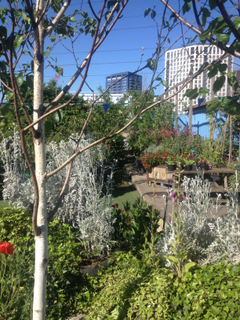 Unused temporary ‘meanwhile’ sites are greened up into vibrant, active, spaces for local community wellbeing. The movable garden encompasses a mini-orchard, wild-life pond, opportunities in volunteering, horticultural, food-growing, up-cycling and events. Core Landscapes showcases how to grow a wide range of plants, including trees, in containers that can withstand moves. Container gardening is very relevant to many people with no garden but may have some balcony or windowsill space. What can be container grown? How does this affect what you grow and how you look after it? What’s the best soil to use? How best to irrigate? What can you grow on a widow-sill? The garden gives people a space to meet others and learn about all forms of horticulture in a relaxed and supportive environment. We work with people of all ages and backgrounds and have links with numerous local community-based organisations that engage with the project in lots of different ways. Propagation, plant maintenance, landscaping and construction are a large part of our project and offer a range of opportunities to our regular volunteers. The project is anchored around our capacity to propagate the plants that source the garden, plant nursery other local community green-spaces. We advocate organic gardening without the use of harmful pesticides and insecticides – aiming to create spaces that promote good physical and mental health and encourage wildlife.